using monads in C++. Previously: The Tale of Two Monads. To start from the beginning, go to Using Monads in C++ to Solve Constraints: 1. In the previous post I showed some very general programming techniques based on functional data structures and monads. A lot of the code I wrote to solve this particular arithmetic puzzle is easily reusable. In fact the monadic approach is perfect for constructing libraries. I talked about it when discussing C++ futures and ranges. A monad is a pure expression of composability, and composability is the most important feature of any library. You would be justified to think that rolling out a monad library just to solve a simple arithmetic puzzle is overkill. But I’m sure you can imagine a lot of other, more complex problems that could be solved using the same techniques. You might also fear that such functional methods — especially when implemented in C++, which is not optimized for this kind of programming — would lead to less performant code. This doesn’t matter too much if you are solving a one-shot problem, and the time you spend developing and debugging your code dwarfs the time it takes the program to complete execution. But even if performance were an issue and you were faced with a larger problem, functional code could be parallelized much easier than its imperative counterpart with no danger of concurrency bugs. So you might actually get better performance from functional code by running it in parallel. What immediately stands out is the amount of repetition: eight lines of code look almost exactly the same. Conceptually, these lines correspond to eight nested loops that would be used in the imperative solution. The question is, how can we abstract over control structures, such as loops? But in our monadic implementation the loops are replaced with higher-order functions, and that opens up a path toward even further abstraction. The first observation is that we are missing a data structure that should correspond to the central concept we use when describing the solution — the substitution. We are substituting numbers for letters, but we only see those letters as names of variables. A more natural implementation would use a map data structure, mapping characters to integers. Notice, however, that this mapping has to be dynamically collected and torn down as we are exploring successive branches of the solution space. The imperative approach would demand backtracking. The functional approach makes use of persistent data structures. I have described such data structures previously, in particular a persistent red-black tree. It can be easily extended to a red-black map. You can find the implementation on github. Don’t worry about the quadratic running time of nub — it’s only called once. With those preliminaries out of the way, let’s concentrate on analyzing the code. We have a series of nested mbind calls. The simplest thing is to turn these nested calls into recursion. This involves setting up the first recursive call, implementing the recursive function, and writing the code to terminate the recursion. The main observation is that each level of nesting accomplishes one substitution of a character by a number. The recursion should end when we run out of characters to substitute. Let’s first think about what data has to be passed down in a recursive call. One item is the string of characters that still need substituting. The second is the substitution map. While the first argument keeps shrinking, the second one keeps growing. The third argument is the number to be used for the next substitution. When implementing go, we have to think about terminating the recursion. But first, let’s talk about how to continue it. We are called with the next digit to be used for substitution, so we should perform this substitution. This means inserting a key/value pair into our substitution map subst. The key is the first character from the string str. The value is the digit i that we were given. Notice that, because the map is immutable, the method inserted returns a new map with one more entry. This is a persistent data structure, so the new map shares most of its data with its previous version. The creation of the new version takes logarithmic time in the number of entries (just as it does with a regular balanced tree that’s used in the Standard Library std::map). The advantage of using a persistent map is that we don’t have to do any backtracking — the unmodified version is still available after the return from the recursive call. The function prune is lifted almost literally from the original implementation. The only difference is that we are now using a substitution map. It’s a matter of opinion whether the refactored code is simpler or not. It’s definitely easier to generalize and it’s less error prone. But the main point is how easy it was to make the refactorization. The reason for that is that, in functional code there are no hidden dependencies, because there are no hidden side effects. What would usually be considered a side effect in imperative code is accomplished using pure functions and monadic binding. There is no way to forget that a given function works with state, because a function that deals with state has the state specified in its signature — it returns a StateList. And it doesn’t itself modify the state. In fact it doesn’t have access to the state. It just composes functions that will modify the state when executed. That’s why we were able to move these functions around so easily. let send  = toNumber "send"
Some of the simplification comes from using the operator >>= in place of mbind, and a simpler syntax for lambdas. 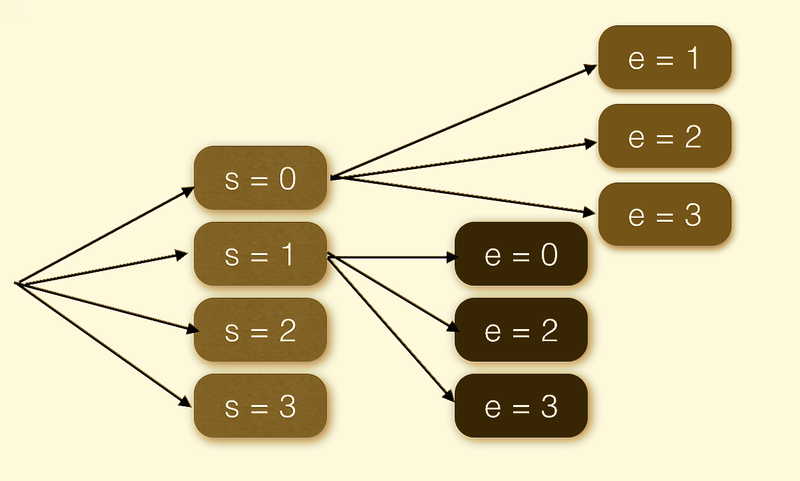 But there is also some built-in syntactic sugar for chains of monadic bindings in the form of the do notation. You see an example of it in the implementation of prune. The funny thing is that C++ is on the verge of introducing something equivalent to do notation called resumable functions. 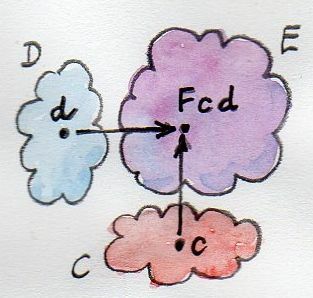 There is a very strong proposal for resumable functions in connection with the future monad, dealing with asynchronous functions. There is talk of using it with generators, or lazy ranges, which are a version of the list monad. But there is still a need for a push towards generalizing resumable functions to user-defined monads, like the one I described in this series. It just doesn’t make sense to add separate language extensions for each aspect of the same general pattern. This pattern has been known in functional programming for a long time and it’s called a monad. It’s a very useful and versatile pattern whose importance has been steadily growing as the complexity of software projects increases. The code for this blog is available on github. Douglas M. Auclair, MonadPlus: What a Super Monad!, The Monad.Reader Issue 11, August 25, 2008. It contains the Haskell implementation of the solution to this puzzle. Justin Le, Unique sample drawing & searches with List and StateT — “Send more money”. It was the blog post that inspired this series. A constraint satisfaction problem may be solved by brute force, by trying all possible substitutions. This may be done using the imperative approach with loops, or a declarative approach with the list monad. The list monad works by fanning out a list of “alternative universes,” one for each individual substitution. It lets us explore the breadth of the solution space. The universes in which the substitution passes all the constraints are then gathered together to form the solution. We noticed also that, as we are traversing the depth of the solution space, we could avoid testing unnecessary branches by keeping track of some state. Indeed, we start with a list of 10 possibilities for the first character, but there are only 9 possibilities for the second character, 8 for the third, and so on. It makes sense to start with a list of ten digits, and keep removing digits as we make our choices. At every point, the list of remaining choices is the state we have to keep track of. Again, there is the imperative approach and the functional approach to state. The imperative approach makes the state mutable and the composition of actions requires backtracking. The functional approach uses persistent, immutable data structures, and the composition is done at the level of functions — plans of action that can be executed once the state is available. These plans of action form the state monad. The functional solution to our problem involves the combination of the list monad and the state monad. Mashing two monads together is not trivial — in Haskell this is done using monad transformers — but here I’ll show you how to do it manually. In the state monad, our basic data structure was a function that took a state and returned a pair: a value and a new state. Now we want our functions to generate, as in quantum mechanics, a whole list of alternative universes, each described by a pair: a value and a state. Notice that we have to vary both the value and the state within the list. For instance, the function that selects a number from a list should produce a different number and a different list in each of the alternative universes. If the choice is, say, 3, the new state will have 3 removed from the list. As we’ve seen before, the essence of every monad is the composition of individual actions. 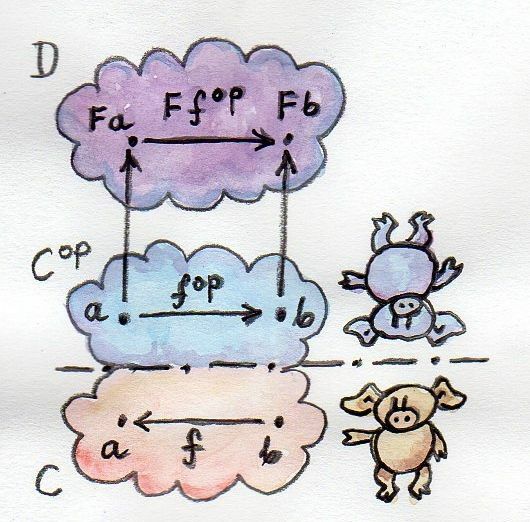 The higher-order function mbind that does the composition has the same structure for every monad. It takes two arguments. One argument is the result of our previous activity. For the list monad, it was a list of values. For the state monad it was a plan of action to produce a value (paired with the leftover state). For the combination state-list monad it will be a plan of action to produce a list of values (each combined with the leftover state). The second argument to mbind is a continuation. It takes a single value. It’s supposed to be the value that is encapsulated in the first argument. In the case of the list monad, it was one value from the list. In the case of the state monad, it was the value that would be returned by the execution of the plan. In the combined state-list monad, this will be one of the values produced by the plan. The continuation is supposed to produce the final result, be it a list of values or a plan. In the state-list monad it will be a plan to produce a list of values, each with its own leftover state. Finally, the result of mbind is the composite: for the list monad it was a list, for the state monad it was a plan, and for the combination, it will be a plan to produce a list of values and states. The implementation of mbind is a combination of what we did for the list monad and for the state monad. To begin with, we are supposed to return a plan, so we have to create a lambda. This lambda takes a state s as an argument. 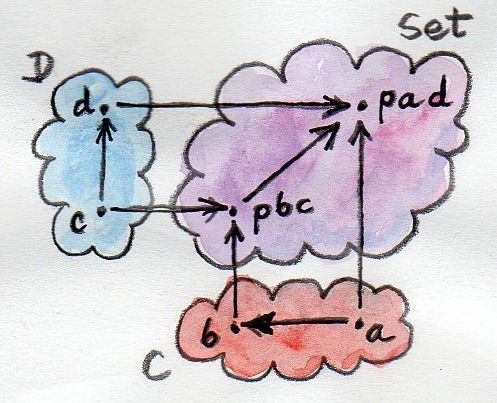 Inside the lambda, given the state, we can run the first argument — the plan. We get a list of pairs. Each pair contains a value and a new state. We want to execute the continuation k for each of these values. To do that, we run fmap over this list (think std::transform, but less messy). Inside fmap, we disassemble each pair into value and state, and execute the continuation k over the value. The result is a new plan. We run this plan, passing it the new state. The result is a list of pairs: value, state. Since each item in the list produces a list, the result of fmap is a list of lists. Just like we did in the list monad, we concatenate all these lists into one big list using concatAll. Notice that, even though the value resulting from running the first argument to mthen is discarded, we still have to run it because we need the modified state. In a sense, we are running it only “for side effects,” although all these functions are pure and have no real side effects. Once again, we can have our purity cake and eat it too, simulating side effects with pure functions. Every time we generate a candidate substitution, we have to check if it satisfies our constraints. That would be easy if we could access the substitution. But we are in a rather peculiar situation: We are writing code that deals with plans to produce substitutions. How do you test a plan? Obviously we need to write a plan to do the testing (haven’t we heard that before?). Here’s the trick: Look at the implementation of mthen (or mbind for that matter). When is the continuation not executed? The continuation is not executed if the list passed to fmap is empty. Not executing the continuation is equivalent to aborting the computation. And what does mthen return in that case? An empty list! So the way to abort a computation is to pass an argument to mthen that produces an empty list. Such a poison pill of a plan is produced by a function traditionally called mzero. In functional programming, a monad that supports this functionality is called a “monad plus” (it also has a function called mplus). It so happens that the list monad and the state-list monad are both plus. Now we need a function that produces a poison pill conditionally, so we can pass the result of this function to mthen. Remember, mthen ignores the individual results, but is sensitive to the size of the list. The function guard, on success, produces a discardable value — here, a nullptr — in a singleton list. This will trigger the execution of the continuation in mthen, while discarding the nullptr. On failure, guard produces mzero, which will abort the computation. Everything I’ve described so far is reusable code that should be put in a library. Equipped with the state-list monad library, all the client needs to do is to write a few utility functions and combine them into a solution. Here’s the function that picks a number from a list. Actually, it picks a number from a list in all possible ways. It returns a list of all picks paired with the remainders of the list. This function is our non-deterministic selection plan. It starts by creating the basic plan called sel for picking numbers from a list. (The list is the state that will be provided later.) It binds this selection to a very large continuation that produces the final result — the plan to produce triples of numbers. Here, sel is really a plan to produce a list, but the continuation expects just one number, s. If you look at the implementation of mbind, you’ll see that this continuation is called for every single pick, and the results are aggregated into one list. The large continuation that is passed to the first mbind is itself implemented using mbind. This one, again, takes the plan sel. But we know that the state on which this sel will operate is one element shorter than the one before it. This second selection is passed to the next continuation, and so on. Then the pruning begins: There is an mthen that takes a guard that aborts all computations where either s or m is zero. Then three numbers are formed from the selected digits. Notice that all those digits are captured by the enclosing lambdas by value (the [=] clauses). Yet another mthen takes a guard that checks the arithmetics and, if that one passes, the final plan to produce a singleton triple (send, more, money) is returned. The function evalStateList works the same way as runStateList except that it discards the leftover state. You can either implement it or use runStateList instead. One of the advantages of functional programming (other than thread safety) is that it makes refactoring really easy. Did you notice that 8 lines of code in our solution are almost identical? That’s outrageous! We have to do something about it. And while we’re at it, isn’t it obvious that a substitution should be represented as a map from characters to digits? I’ll show you how to do it in the next installment. All this code and more is available on github. I am sometimes asked by C++ programmers to give an example of a problem that can’t be solved without monads. This is the wrong kind of question — it’s like asking if there is a problem that can’t be solved without for loops. Obviously, if your language supports a goto, you can live without for loops. What monads (and for loops) can do for you is to help you structure your code. The use of loops and if statements lets you convert spaghetti code into structured code. Similarly, the use of monads lets you convert imperative code into declarative code. These are the kind of transformations that make code easier to write, understand, maintain, and generalize. So here’s a problem that you may get as an interview question. It’s a small problem, so the advantages of various approaches might not be immediately obvious, especially if you’ve been trained all your life in imperative programming, and you are seeing monads for the first time. Each letter correspond to a different digit between 0 and 9. Before you continue reading this post, try to think about how you would approach this problem. It never hurts to impress your interviewer with your general knowledge by correctly classifying the problem. This one belongs to the class of “constraint satisfaction problems.” The obvious constraint is that the numbers obtained by substituting letters with digits have to add up correctly. There are also some less obvious constraints, namely the numbers should not start with zero. However, the small size of the problem suggests that a simple brute force approach is probably best. The interviewer might ask you to estimate the number of possible substitutions, which is 10!/(10 – 8)! or roughly 2 million. That’s not a lot. So, really, the solution boils down to generating all those substitutions and testing the constraints for each. and so on, the last one involving 7 inequalities… Effectively you have replaced the uniqueness condition with 28 new constraints. This would probably get you through the interview at Microsoft, Google, or Facebook, but really, can’t you do better than that? Before I proceed, I should mention that what follows is almost a direct translation of a Haskell program from the blog post by Justin Le. I strongly encourage everybody to learn some Haskell, but in the meanwhile I’ll be happy to serve as your translator. The problem with our naive solution is the 28 additional constraints. Well, I guess one could live with that — except that this is just a tiny example of a whole range of constraint satisfaction problems, and it makes sense to figure out a more general approach. The problem can actually be formulated as a superposition of two separate concerns. One deals with the depth and the other with the breadth of the search for solutions. Let me touch on the depth issue first. Let’s consider the problem of creating just one substitution of letters with numbers. This could be described as picking 8 digits from a list of 0, 1, …9, one at a time. Once a digit is picked, it’s no longer in the list. We don’t want to hard code the list, so we’ll make it a parameter to our algorithm. Notice that this approach works even if the list contains duplicates, or if the list elements are not easily comparable for equality (for instance, if they are futures). We’ll discuss the list-picking part of the problem in more detail later. Now let’s talk about breadth: we have to repeat the above process for all possible picks. This is what the 8 nested loops were doing. Except that now we are in trouble because each individual pick is destructive. It removes items from the list — it mutates the list. This is a well known problem when searching through solution spaces, and the standard remedy is called backtracking. Once you have processed a particular candidate, you put the elements back in the list, and try the next one. Which means that you have to keep track of your state, either implicitly on your function’s stack, or in a separate explicit data structure. Wait a moment! Weren’t we supposed to talk about functional programming? So what’s all this talk about mutation and state? Well, who said you can’t have state in functional programming? Functional programmers have been using the state monad since time immemorial. And mutation is not an issue if you’re using persistent data structures. So fasten your seat belts and make sure your folding trays are in the upright position. We’ll start with a small refresher in quantum mechanics. As you may remember from school, quantum processes are non-deterministic. You may repeat the same experiment many times and every time get a different result. There is a very interesting view of quantum mechanics called the many-worlds interpretation, in which every experiment gives rise to multiple alternate histories. So if the spin of an electron may be measured as either up or down, there will be one universe in which it’s up, and one in which it’s down. We’ll use the same approach to solving our puzzle. We’ll create an alternate universe for each digit substitution for a given letter. So we’ll start with 10 universes for the letter s; then we’ll split each of them into ten universes for the letter e, and so on. Of course, most of these universes won’t yield the desired result, so we’ll have to destroy them. I know, it seems kind of wasteful, but in functional programming it’s easy come, easy go. The creation of a new universe is relatively cheap. That’s because new universes are not that different from their parent universes, and they can share almost all of their data. That’s the idea behind persistent data structures. These are the immutable data structures that are “mutated” by cloning. A cloned data structure shares most of its implementation with the parent, except for a small delta. We’ll be using persistent lists described in my earlier post. Once you internalize the many-worlds approach to programming, the implementation is pretty straightforward. First, we need functions that generate new worlds. Since we are cheap, we’ll only generate the parts that are different. So what’s the difference between all the worlds that we get when selecting the substitution for the letter s? Just the number that we assign to s. There are ten worlds corresponding to the ten possible digits (we’ll deal with the constraints like s being different from zero later). So all we need is a function that generates a list of ten digits. These are our ten universes in a nutshell. They share everything else. Once you are in an alternate universe, you have to continue with your life. In functional programming, the rest of your life is just a function called a continuation. I know it sounds like a horrible simplification. All your actions, emotions, and hopes reduced to just one function. Well, maybe the continuation just describes one aspect of your life, the computational part, and you can still hold on to our emotions. The function fmap is similar to std::transform. It applies the continuation k to every element of the list lst. Because k itself produces a list, the result is a list of lists, lstLst. The function concatAll concatenates all those lists into one big list. It’s a function that returns a singleton list. We use yield when we are done multiplying universes and we just want to return a single value. We use it to create a single-valued continuation. It represents the lonesome boring life, devoid of any choices. I will later rename these functions to mbind and mreturn, because they are part of any monad, not just the list monad. The names like for_each or yield have a very imperative ring to them. That’s because, in functional programming, monadic code plays a role similar to imperative code. But neither for_each nor yield are control structures — they are functions. 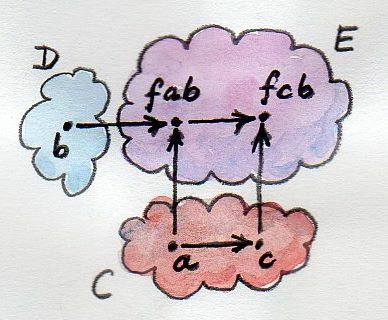 In particular for_each, which sounds and works like a loop, is just a higher order function; and so is fmap, which is used in its implementation. Of course, at some level the code becomes imperative — fmap can either be implemented recursively or using an actual loop — but the top levels are just declarations of functions. Hence, declarative programming. There is a slight difference between a loop and a function on lists like for_each: for_each takes a whole list as an argument, while a loop might generate individual items — in this case integers — on the fly. This is not a problem in a lazy functional language like Haskell, where a list is evaluated on demand. The same behavior may be implemented in C++ using streams or lazy ranges. I won’t use it here, since the lists we are dealing with are short, but you can read more about it in my earlier post Getting Lazy with C++. The first for_each takes a selection of integers, sel, (never mind how we deal with uniqueness); and a continuation, a lambda, that takes one integer, s, and produces a list of solutions — tuples of three integers. This continuation, in turn, calls for_each with a selection for the next letter, e, and another continuation that returns a list of solutions, and so on. The innermost continuation is a conditional version of yield called yield_if. It checks a condition and produces a zero- or one-element list of solutions. Internally, it calls another yield_if, which calls the ultimate yield. If that final yield is called (and it might not be, if one of the previous conditions fails), it will produce a solution — a triple of numbers. If there is more than one solution, these singleton lists will get concatenated inside for_each while percolating to the top. In the second part of this post I will come back to the problem of picking unique numbers and introduce the state monad. You can also have a peek at the code on github. Implement for_each and yield for a vector instead of a List. Use the Standard Library transform instead of fmap. Using the list monad (or your vector monad), write a function that generates all positions on a chessboard as pairs of characters between 'a' and 'h' and numbers between 1 and 8. Implement a version of for_each (call it repeat) that takes a continuation k of the type function<List<B>()> (notice the void argument). The function repeat calls k for each element of the list lst, but it ignores the element itself. Categories for Programmers. Previously Products and Coproducts. See the Table of Contents. We’ve seen two basic ways of combining types: using a product and a coproduct. It turns out that a lot of data structures in everyday programming can be built using just these two mechanisms. This fact has important practical consequences. Many properties of data structures are composable. For instance, if you know how to compare values of basic types for equality, and you know how to generalize these comparisons to product and coproduct types, you can automate the derivation of equality operators for composite types. In Haskell you can automatically derive equality, comparison, conversion to and from string, and more, for a large subset of composite types. Let’s have a closer look at product and sum types as they appear in programming. The canonical implementation of a product of two types in a programming language is a pair. In Haskell, a pair is a primitive type constructor; in C++ it’s a relatively complex template defined in the Standard Library. You can think of the two pairs as simply using a different format for storing the same data. It’s just like big endian vs. little endian. so it’s an isomorphism. These are just different ways of repackaging the same data. These observations can be formalized by saying that Set (the category of sets) is a monoidal category. 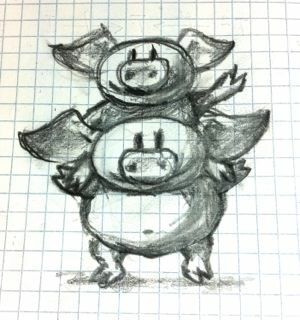 It’s a category that’s also a monoid, in the sense that you can multiply objects (here, take their cartesian product). I’ll talk more about monoidal categories, and give the full definition in the future. The first line is the type declaration. It uses the type constructor Pair, with String and Bool replacing a and the b in the generic definition of Pair. The second line defines the actual value by passing a concrete string and a concrete Boolean to the data constructor P. Type constructors are used to construct types; data constructors, to construct values. Similarly, you can use (,,) to create triples, and so on. which is just a product of String and Bool, but it’s given its own name and constructor. The advantage of this style of declaration is that you may define many types that have the same content but different meaning and functionality, and which cannot be substituted for each other. Programming with tuples and multi-argument constructors can get messy and error prone — keeping track of which component represents what. It’s often preferable to give names to components. A product type with named fields is called a record in Haskell, and a struct in C.
The parentheses could be omitted in this case, because an infix operator has lower precedence than a function call. is isomorphic to a. That’s because there is no way to construct a Right version of this type — there isn’t a value of type Void. The only inhabitants of Either a Void are constructed using the Left constructors and they simply encapsulate a value of type a. So, symbolically, a + 0 = a. Sum types are pretty common in Haskell, but their C++ equivalents, unions or variants, are much less common. There are several reasons for that. is the primitive bool in C++. Notice that the two Haskell constructors Nil and Cons are translated into two overloaded List constructors with analogous arguments (none, for Nil; and a value and a list for Cons). The List class doesn’t need a tag to distinguish between the two components of the sum type. Instead it uses the special nullptr value for _head to encode Nil. The main difference, though, between Haskell and C++ types is that Haskell data structures are immutable. If you create an object using one particular constructor, the object will forever remember which constructor was used and what arguments were passed to it. So a Maybe object that was created as Just "energy" will never turn into Nothing. Similarly, an empty list will forever be empty, and a list of three elements will always have the same three elements. It’s this immutability that makes construction reversible. Given an object, you can always disassemble it down to parts that were used in its construction. This deconstruction is done with pattern matching and it reuses constructors as patterns. Constructor arguments, if any, are replaced with variables (or other patterns). The first part of the definition of maybeTail uses the Nil constructor as pattern and returns Nothing. The second part uses the Cons constructor as pattern. It replaces the first constructor argument with a wildcard, because we are not interested in it. The second argument to Cons is bound to the variable t (I will call these things variables even though, strictly speaking, they never vary: once bound to an expression, a variable never changes). The return value is Just t. Now, depending on how your List was created, it will match one of the clauses. If it was created using Cons, the two arguments that were passed to it will be retrieved (and the first discarded). 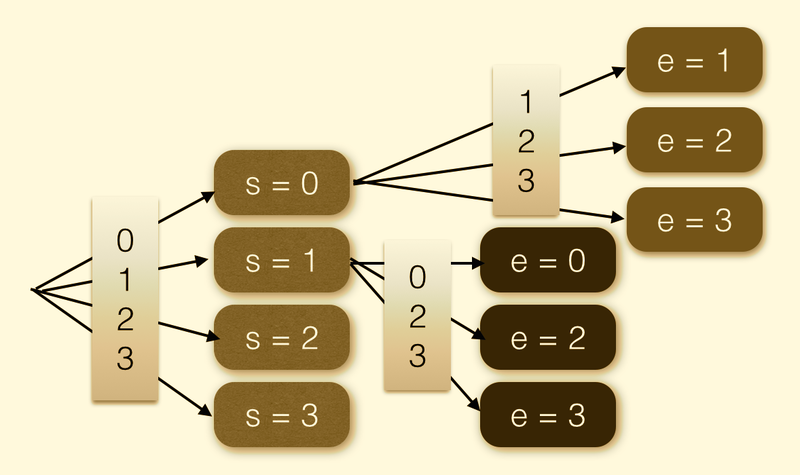 Even more elaborate sum types are implemented in C++ using polymorphic class hierarchies. 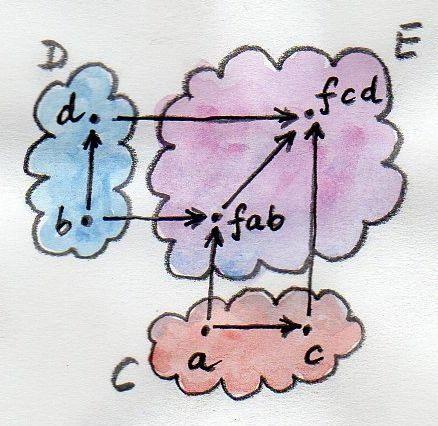 A family of classes with a common ancestor may be understood as one variant type, in which the vtable serves as a hidden tag. What in Haskell would be done by pattern matching on the constructor, and by calling specialized code, in C++ is accomplished by dispatching a call to a virtual function based on the vtable pointer. You will rarely see union used as a sum type in C++ because of severe limitations on what can go into a union. You can’t even put a std::string into a union because it has a copy constructor. Taken separately, product and sum types can be used to define a variety of useful data structures, but the real strength comes from combining the two. Once again we are invoking the power of composition. Let’s summarize what we’ve discovered so far. 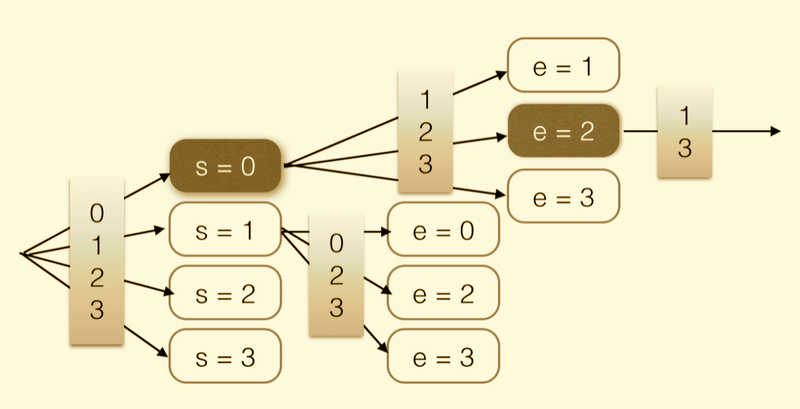 We’ve seen two commutative monoidal structures underlying the type system: We have the sum types with Void as the neutral element, and the product types with the unit type, (), as the neutral element. We’d like to think of them as analogous to addition and multiplication. In this analogy, Void would correspond to zero, and unit, (), to one. Let’s see how far we can stretch this analogy. For instance, does multiplication by zero give zero? In other words, is a product type with one component being Void isomorphic to Void? For example, is it possible to create a pair of, say Int and Void? To create a pair you need two values. Although you can easily come up with an integer, there is no value of type Void. 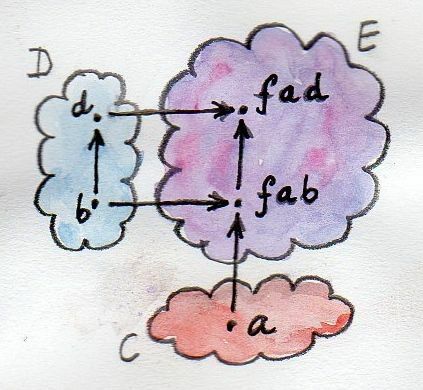 Therefore, for any type a, the type (a, Void) is uninhabited — has no values — and is therefore equivalent to Void. In other words, a*0 = 0.
the e in case e of will be equal to Left "Hi!". It will match the pattern Left y, substituting "Hi!" for y. Since the x has already been matched to 2, the result of the case of clause, and the whole function, will be Left (2, "Hi! "), as expected. I’m not going to prove that these two functions are the inverse of each other, but if you think about it, they must be! They are just trivially re-packing the contents of the two data structures. It’s the same data, only different format. 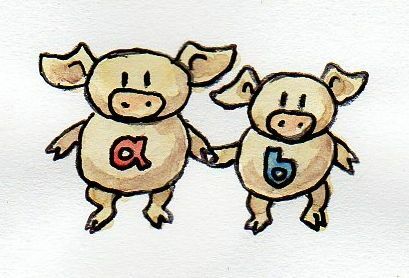 We end up with an infinite sum of products (tuples), which can be interpreted as: A list is either empty, 1; or a singleton, a; or a pair, a*a; or a triple, a*a*a; etc… Well, that’s exactly what a list is — a string of as! There’s much more to lists than that, and we’ll come back to them and other recursive data structures after we learn about functors and fixed points. Solving equations with symbolic variables — that’s algebra! It’s what gives these types their name: algebraic data types. This analogy goes deeper, and is the basis of the Curry-Howard isomorphism between logic and type theory. We’ll come back to it when we talk about function types. Implement Shape in C++ or Java as an interface and create two classes: Circle and Rect. Implement area as a virtual function. Add circ to your C++ or Java implementation. What parts of the original code did you have to touch? Thanks go to Gershom Bazerman for reviewing this post and helpful comments.